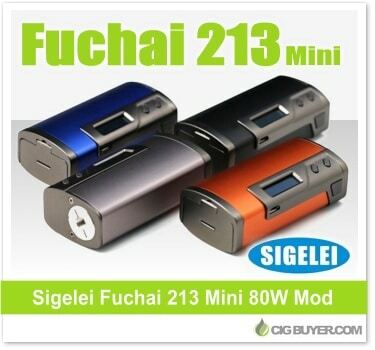 Sigelei Fuchai 213 Mini 80W Box Mod – ONLY $25.00! The Sigelei Fuchai 213 Mod has gained a lot of fanfare; not only because of it’s power and advanced features, but because of it’s visually appealing style. Well if you need something more compact and don’t require 200W of power, an attractive reduced-size version is now available – the Sigelei Fuchai 213 Mini Box Mod. It’s virtually identical to its big brother, with the same OLED screen and interface, but it only takes one 18650 battery (rather than two) and has a maximum output of 80W with preheat and temperature control.